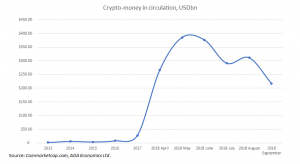 The current total cryptocurrency money supply has been decreasing by $100 billion in just one month. The market cap is well above 2017 levels, but we still expect a modest negative wealth effect for some. Despite enjoying a period of relative price stability in August at around $7000, Bitcoin has suffered a huge blow in the first days of September, falling by $1000 in only 24 hours on September 6, probably due to Goldman Sachs announcing to drop plans for a cryptocurrency trading desk. Extreme price volatility due to negative press still remains a hindrance for the solidification of the cryptocurrency market, as much as excessive Bitcoin dominance in the overall market capitalisation (Bitcoin accounts for more than 50% of the total market cap). Next PostCzech Republic: Has the housing market peaked?